I am always asked how I got from my home in England to Jonestown, and I struggle to answer that myself. I remember once standing in front of two doorways at Oakland Airport. The left hand door would take me to the flight to LA and home, but I chose the right hand one and took a helicopter flight across the Bay back to San Francisco. After joining the Temple, I was often assigned security jobs around the church and parking lots, in which the buses were parked. Once when I did security at Benjamin Franklin during the night, I walked through a changing room and came upon Jim asleep in a sleeping bag on a concrete floor, with his sons on either side. I remember thinking, well, whatever he is getting out of this way of life, it is not creature comforts. One thing I haven’t figured out yet is how I very quickly ended up on the fringe of the inner circle, so to speak. I can only assume that because I was so enthusiastic after joining PT, Karen Layton must have told Jim Jones and he must have instructed her to bring me to the council meetings. This was something for which I was totally unsuitable, as my brain was always three paces behind everybody else and I had no confidence to speak up in a meeting situation. I also have a sense that I got away more lightly than others as regards the verbal harangues most people endured from time to time within the meetings. I don’t know why, unless it’s because I tried not to be too defensive. I didn’t see discipline in the Valley, and for much of the time that the Temple was in San Francisco I was already in Guyana. I did see it in Jonestown, though, including the time when one woman was knocked around quite a bit. I thought whatever she was supposed to have done, it certainly didn’t merit anything like that, it was outrageous. I felt thoroughly disgusted but totally unable to do anything about it. In the early days of Jonestown, everybody was enthusiastic, full of hope for a new beginning. Mike Touchette and I were there from the very start. When we were in Jonestown, my job was to drive the ex-army 6×6 truck to Port Kaituma, in which I transported the Guyanese workers to Jonestown and returned them in the evening. They did field work in the early days, long before the bulk of people came down to Jonestown. I did tractor driving in the fields and operated the second bulldozer when it arrived. I was given instruction by Mike, who first learned how to operate our first bulldozer. I also worked with Mike’s brother, Albert, on his construction crew building the original houses. 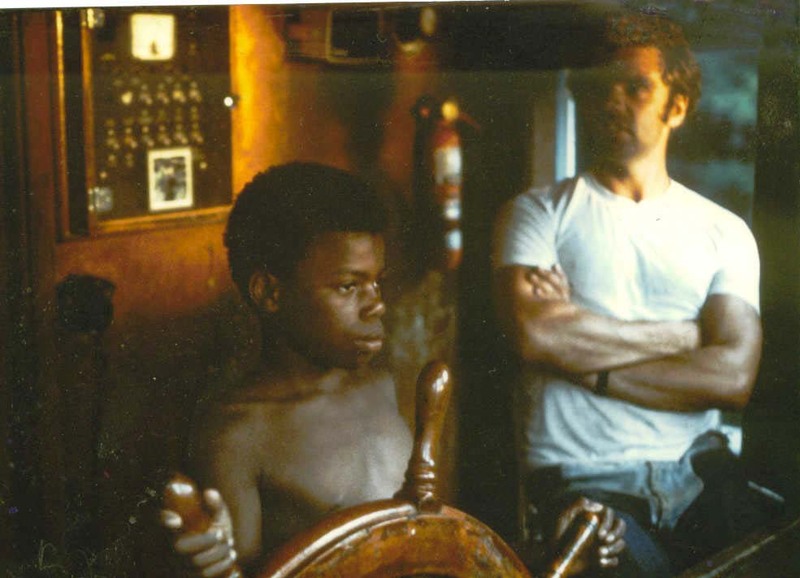 I spent three months on a trawler learning to fish, which kept me away from Jonestown. It was envisaged that we would eventually use Cudjoe for fishing, to supply Jonestown and the Northwest district with fish. One day while doing maintenance work on Cudjoe, a Guyanese soldier appeared on the dock and told me that the country’s president, Mr. Arthur Chung, was touring Port Kaituma and he would presently come to see us. Duly he arrived with his entourage on the dock. His wife asked what the Cudjoe was used for, and about the agricultural project, and could Cudjoe ever be used to supply the region with fish. I said yes, although Cudjoe was busy with transport between Georgetown and Kaituma, we intended to go fishing and could sell fish to the local populace. Cudjoe was primarily a shrimp fishing trawler and all fish caught at the same time as the shrimps were shoveled overboard; it was incredibly wasteful. There was wonderful red snapper, grouper, sea trout and many others. My first trip on Cudjoe at sea, was spent lying on the back deck vomiting through the scupper holes. Cudjoe was used to take supplies and diesel from Georgetown to Port Kaituma. The most favourite trip we ever took with Cudjoe, was up the Waini river to the Barama mouth sawmill. It was run by a Mr. Bacchus, who also had holdings on Wakenaam Island in the Essequibo river mouth. We used to stack boards up to 30 feet long on the Cudjoe’s deck and take them back to Port Kaituma for Jonestown. The Amerindians used to float the logs in rafts down the river to the sawmill, and used an ancient steam engine to wrench them onto the log deck. Then they were squared with a caterpillar driven circular saw, then sawn to thickness by gang saws. These were like giant hack-saws which reciprocated up and down under steam power. The trip up the Waini River was most spectacular. It took several hours and we would be gone for several days. Charlie used to argue with Bacchus over the price, which was always quite amusing. Even then Bacchus said he would have installed modern machinery if the political situation had been more stable. Sometimes I accompanied Charlie in Georgetown to hardware stores to buy nails and fasteners etc. After discussions over prices, Charlie would say in his imitation Guyanese accent, “but Mohammad man, I believe you are trying to cheat me, man”. These fellows would fall off their chair laughing. Also in the early days, we often spent the dark evenings watching films, which we rented from Georgetown, including Hello Dolly, Paint Your Wagon, On a Clear Day, Super Cops and West World. We watched them so often, to this day, I can remember most of the words and sing the songs. Whenever they come on TV, it takes me back to the early, happy days of Jonestown. Once we watched a film called Sunshine, a sad movie about a young woman who gets cancer but who makes provision for her child after she dies. Jim Jones was there watching with us, and at the start of the film he was offering his commentary in his usual way, but eventually even he shut up as the film progressed. At the end, he said something to the effect that it was really sad. Cudjoe also did the government run from Morawhanna to Port Kaituma when their boat, The Damon, was out of use. Eventually the Temple bought a small cargo ship called Albatross. The first time I saw it was at Port Kaituma as Cudjoe was leaving for Georgetown. The next time I saw Albatross, she was broken down in Georgetown. I was assigned to represent PT on Albatross. I assumed that it has been bought as a money earning venture for PT as we were always short of money. Imagine my astonishment when the revelations of all the millions came out later. Eventually it was repaired through Cleve Swinney’s ingenuity by manufacturing parts for the gearbox. Our first trip was to Trinidad with a cargo of rice. Although I bellyached about the Albatross, I know that it may well have saved my life. That’s where I was on November 18, on Albatross in Port of Spain harbour, together with temple members, Charlie Touchette, Helen Swinney, and Richard Janaro, and a small non-Temple crew. Charlie Touchette and I knew a man named Compton Gonzalez in Georgetown. He warned us never to buy a vessel that had been in the Caribbean for many years because it would be reduced to a scrapheap. He proposed that we travel to Europe and buy a vessel in the Netherlands and take a “dangerous cargo.” i.e. explosives, to the Caribbean. This would have paid for the whole thing and we would have had a relatively modern vessel that would have been useful, not a liability like Albatross. Compton would come with us as he had contacts there to organize everything. I don’t think this scheme was ever seriously entertained. I have wondered if Jim were bipolar or had mental illness. I have known one other person diagnosed as bipolar, and there were similarities, but obviously Jones was on a much grander scale. Both tried to manipulate other people to their own advantage. And then there was Jim’s massive determination to run PT by himself, which he thought he could do when he was manic. I also remember his broadcasts in Jonestown, when his speech was slurred and rambling. He was also often absent for periods of time. This could correspond to his lows. I remember being angry with the Concerned Relatives for bringing in Congressman Ryan and reporters to Jonestown. That was Jones’ worst nightmare. I talked about this with Charlie Touchette, but he said he couldn’t see what else the Concerned Relatives could have done, which may well be true. But I also think that eventually there may have been a revolution in Jonestown, because more and more people were beginning to see through Jim and his antics. There were a number of rumors and conspiracies to come out of Jonestown, linking me to US intelligence agencies, which are of course total rubbish. Through the mid-seventies, I was in Guyana working on the Jonestown project. I had joined PT from leaving school and had no military or intelligence background whatsoever. I can’t imagine the CIA having any use for a naive farm boy. As for disappearing after November 18th, the FBI knew where I was at Christmas ’78, as they interviewed Charlie and me in Barbados. There were other rumours, too. One was about the mysterious bags that were taken to Jonestown, wondering if they contained cement to make tunnels for us to hide supplies or contraband. Those rumours still persist in Port Kaituma, even after 40 years. The fact is, the bags were filled with, I can assure everyone, ground seashells to use as lime for the soil. They came from Shell Beach between the Pomeroon and Waini Rivers. The chemical property of the seashells is calcium carbonate, and the purpose then – as it still is, even on my organic farm here in Britain – is to balance the soil, so that you feed the soil and the soil feeds the plant. I enjoyed my time in Guyana immensely, and would also like to see the country portrayed in a more favourable light. After all, it was a small country struggling in a post-colonial world. I always had a sense that it was a country with great potential, whereas the rest of the Caribbean is made up of Islands. The main problem was that they had an abundance of cheap rum, which was more attractive to drink than work. It is a universal problem that the countryside is drained of people, who migrate to the bright lights of the big city. I had a sense that Jonestown came so close to succeeding but yet had so far to go. Even the Guyanese were very sad about its demise, as they too hoped it would succeed. I do find it difficult to examine my feelings about Jonestown. To do it justice, I have to stop everything else and go back to remember what happened, as it is such a monumental subject, and the emotions are horrendous, they are always lurking while you remember the good parts. It is difficult to separate the two memories, the good and the bad. The good thing is that I met some really great people, some are not here but those who are, are friends for life.